This entry was posted on March 14, 2008 at 10:43 am	and is filed under Compact Framework, Custom Controls, User Interface Design, Visual Studio, Windows Forms, Windows Mobile. You can follow any responses to this entry through the RSS 2.0 feed. You can leave a response, or trackback from your own site. Thanks for the excellent article is seems to be quite difficult to find information about implementing design time functionality for custom controls in the compact framework. I’m currently in the process of trying to create a control that holds a collection of buttons and am having quite a lot of difficulty trying to figure out how to add buttons to my collection at design time. I believe that in a windows forms application I would need to create a TypeConverter and CollectionEditor for my collection but when I tried to create a TypeConverter for my buttons I discovered that the methods I need to override are not available in the compact framework. If you know anything about how I could do this I would be most grateful of any help. Cool! Many thanks, I was looking for some good explaination and a starting point – both covered by your articles. In Vsnet2008 (at least on my machine) the xmta file is not created when adding an attribute through the class diagram designer. DesignerSerializer – let’s say your custom control initializes its property by creating a new object by calling its constructor. Now let’s say that the class of that property has several constructors. The default designer serializer will use – well – the default constructor. But if you do not want it to use the default constructor, you have to provide your own designer serializer. Or let’s say you do not want the property to be initialized with an object of the same class as the class of that property, but rather with a derived class – again – use your own designer serializer. Great article, by the way. If you plan to write an article about custom designer serializer, I’d be happy to read it, as it seems to be a rather complicated topic for me. The custom designer serializer allows you to specify what pieces of code should be generated by Visual Studio and it’s seems tricky to me. Wow, one of the best descriptions to work around .NET CF’s deficiencies I’ve run across. Thank you so much for sharing your insight! 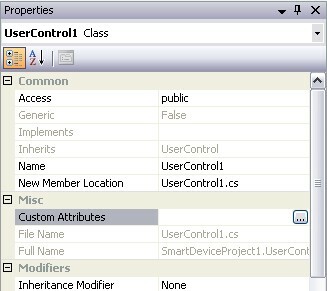 I found some additional background information about the extra design-time assembly and attributes in a Microsoft article Creating and Migrating Smart Device Custom Controls by Using Visual Studio 2005. 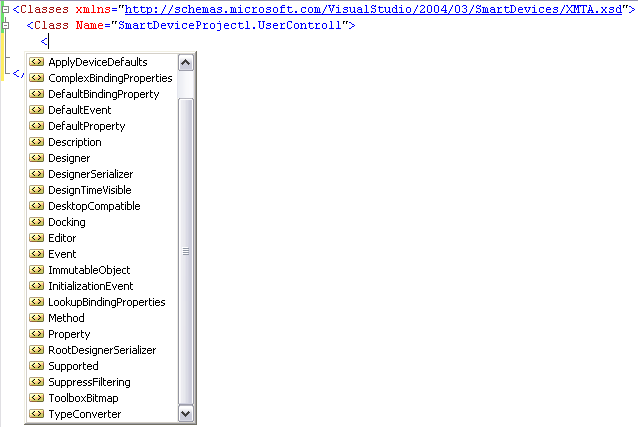 I’ve seen no mention of this in the documentation that comes with VS, of course. what is really missing here, is the DefaultValue XMTA attribute! In the previous post I used the wrong formatting for the XML sample, sorry for that. Good work buddy, keep writing.